The South Mountain Conservancy (SMC), an organization which advocates for preservation of the South Mountain Reservation, is reacting to the construction which started this month on the South Orange Avenue 'S-Curves'. The 'S-Curves' travel through the center of the park in Maplewood and Millburn Townships. Dennis Percher, the chair of the board of trustees at the SMC tells South Orange Maplewood Place that despite several concerns he has regarding the project, Essex County officials have been doing a "very good job" and is "very amenable" to the concerns of the SMC. "I was quite impressed with the effort the County engineers and consultants plan to plant approximately 6,300 trees and bushes to compensate for the trees that will be removed", said Percher. "These are trees that are 3 1/2 to 5 inches in diameter". According to Percher, trees will be planted along South Orange Avenue and in other areas throughout the reservation. The SMC is working with Essex County to decide where the trees will be placed. The SMC wants the county to plant dogwood trees on Dogwood Hillside, which is located along Brookside Drive. "One time, (it) had numerous (dogwood) trees planted by the Olmsted Brothers", said Percher, "now it will live up to that name". The Olmsted Brothers designed South Mountain Reservation, along with several other parks, including Central Park in Manhattan, Memorial Park in Maplewood, and Grover Cleveland Park in Caldwell. However, Percher expressed concern over the possible ongoing watering the new trees. "If they plant (the trees) in the spring, then there is usually enough moisture to have trees establish themselves". Percher went on to say that the SMC "does not want a significant portion of trees dying in the first year or two". Another part of the project is that a new bridge will be built at the eastern end of the 'S-Curves'. The new bridge will eventually connect the Longwood Trail to other trails west of South Orange Avenue. Percher said that the original plan for the bridge called for "hikers (being) forced right into the Girl Scout camp", which is located off of South Orange Avenue. Percher said that he spoke out against this plan at a public hearing in 2011, and the county agreed to move the location of the new bridge so that it would not force hikers to walk through the Girl Scout camping area. Percher said that the SMC will build 100 feet of trail to allow hikers to easily access the Longwood Trail from the bridge. The Longwood Trail goes from behind the Girl Scout camping area to Turtle Back Rock picnic area in West Orange. The project also calls for the current Lenape Trail bridge over South Orange Avenue to be replaced with another bridge. Percher said that the SMC "does not know the timing" of when the bridge will be replaced, but expressed concern that the replacement could interfere with the annual Mayapple Run and SMC guided hikes. Percher summed the project up by saying that "it is unfortunate and a concern that we are losing land, but this is a project they've (Essex County) been working on since the initial scoping 10 years ago. There were accidents, and they are trying to make South Orange Avenue safer". First on PlaceNJ.com: Two pedestrians were injured after being struck by a car in Maplewood Village on Saturday night. Sgt. Niheema Gary of the Maplewood Police Department tells South Orange Maplewood Place that at approximately 9:40PM on Saturday March 29th, a driver was driving on Maplewood Avenue near Inwood Place (161 Maplewood Avenue) when they allegedly backed up, striking two pedestrians who were in the street. The pedestrians, a 49 year old female and a 51 year old male, were brought to University Hospital in Newark for treatment. According to Sgt. Gary, their injuries are not life threatening. Sgt. Gary said that the 21 year old driver remained at the scene of the accident and received two citations. There is still time left to enjoy various specials at Maplewood restaurants for Maplewood Restaurant Week. 25 restaurants are participating this year, including Maplewood Village restaurants like Cactus Charly and Arturo's, Springfield Avenue restaurants like the Rack Cafe and Park Wood Diner, and restaurants in other business districts like Cedar Ridge Cafe and the Maplewood Pizzeria. To see the full list of participating restaurants, click here. 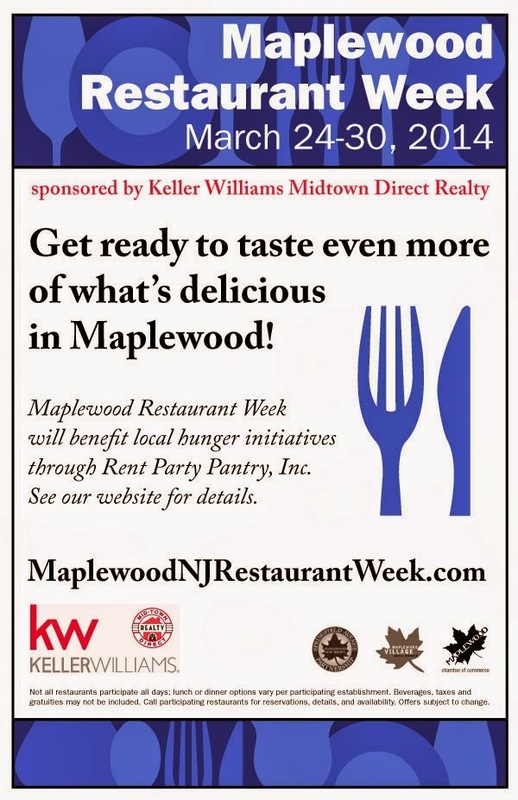 This year, Maplewood Restaurant Week is being sponsored by Keller Williams Midtown Direct Realty, and is supporting the Rent Party Pantry. Several restaurants are donating a percentage of profits earned during Restaurant Week to the pantry, and other restaurants and businesses are collecting canned goods to be donated to the pantry. South Orange Village Center will also have a Restaurant Week this year, running from April 5th to April 12th. More information about South Orange Restaurant Week will be posted next week on South Orange Maplewood Place..
Scott's Deli, a popular delicatessen in the eastern section of Maplewood, will reopen on Monday March 31st. The deli has been closed for over a month due to snow and ice damage. Scott's Deli is located at 290 Elmwood Avenue at the corner of Boyden Avenue, next to Ro's Cleaners and the Elmwood Sweet Shop. Scott's Deli is owned by CHS graduate Scott Clawson, and is well known for their Sloppy Joe Sandwiches. A grand re-opening celebration will take place in April. Dr. Lydia Furnari, the Assistant Superintendent for Curriculum and Instruction at the South Orange Maplewood School District, will leave the district on June 30th. Dr. Furnari has accepted a job as the superintendent at Franklin Lakes Public Schools, a K-8 district in western Bergen County. In a statement posted on the SOMSD website, Dr. Furnari said "I want to thank Dr. Osborne and the Board for their continued support. I cannot emphasize enough my deepest admiration and respect for the administrators, staff, students, families and communities of South Orange & Maplewood. When I joined the school district two years ago, I knew this was a special place, and I continue to marvel at the level of professionalism and dedication of all stakeholders in ensuring that all of our children are well served. While I eagerly anticipate this next exciting stage in my educational journey, I will truly miss the wonderful people I have come to know, and hold in the highest regard". Dr. Brian Osborne, superintendent of the South Orange Maplewood School District, said "Dr. Furnari has consistently proven her creativity and dedication to meeting the varied needs of all learners since she joined us two years ago. During her tenure here, she has brought a new level of collaboration and professionalism to the Office of Curriculum and Instruction, and has helped us move forward on key initiatives including the transition to the Common Core State Standards, implementation of the International Baccalaureate Middle Years Programme in our middle schools, and developing new strategies for meeting the needs of gifted and talented students. I know the SOMSD community joins me in thanking Dr. Furnari for helping to continue building momentum as we strive to fulfill our mission of preparing each and every student for post-secondary educational success. Please join me in wishing her well in her new role." According to the Franklin Lakes-Oakland Suburban News, Dr. Furnari was introduced at Franklin Lakes Board of Education meeting on Tuesday, March 25th. Before SOMSD, Dr. Furnari worked in Montclair and Elizabeth. First on PlaceNJ.com: According to a statement released by Essex County Public Information Officer Anthony Puglisi, Essex County Executive Joseph N. DiVincenzo, Jr. does not support the proposed 880-foot long, 70-foot tall earthen dam which may be built in South Mountain Reservation. If built, the dam would be located on the Rahway River in the western section of South Mountain Reservation. Campbell's Pond, Diamond Mill Pond, Brookside Drive, and many other areas of the reservation would be removed in order to make way for the dam. According to the release, "if constructed, the dam would transform a large part of South Mountain Reservation into a “retention basin” for flood waters after heavy storms, close Brookside Drive and create a structure that would tower over any nearby buildings". Brookside Drive connects Downtown Millburn with South Orange Avenue. “The potential for flooding in Millburn, Cranford and other communities downstream the Rahway River is a serious issue and should be addressed", said DiVincenzo, "however, it can’t come at the expense of destroying an natural resource such as South Mountain Reservation and reducing the quality of life for Essex County residents". The release also stated that there was a similar proposal to build a dam in South Mountain Reservation over 30 years ago. However, a study had found that "the benefit of no work along the West Branch in Millburn resulting from a detention basin was outweighed by the potential environmental damage to the 63 acre area surrounding Campbell’s Pond". Two community groups, called the Rahway Alternative Flood Solutions Alliance (RAFSA) and Save Our Reservation, have been created in order to stop the dam. Save our Reservation, which is chaired by former Maplewood mayor Fred Profeta, launched a petition on Change.org in order to ask the Army Corps of Engineers to stop the dam. As of the time this article was written, the petition had almost 3000 signatures. In response to the announcement that DiVincenzo does not support the proposed dam, Dennis Percher of the South Mountain Conservancy said "through the diligent efforts of Fred Profeta, as head of Save Our Resolution...SOR has been able to create public awareness and mobilize opposition to the dam and 110-acre detention basin". Percher said that "county executive Joe DiVincenzo's public statement today, and those of other politicians, opposing the dam reflects SOR's outreach efforts and is much appreciated. It underscores that these politicians recognize the public's concern for the South Mountain Reservation and the environmental impact a dam would have". According to Percher, "the challenge now is to work with the USACE (United States Army Corps of Engineers) to find alternatives that cumulatively address the flooding problems in Millburn, Cranford, and elsewhere. This will require sharing the responsibility and burden over several towns". According to the Save Our Reservation group, Assemblyman and Assemblywoman John McKeon and Mila Jasey, along with Congressman Donald Payne, have all come out against the proposed dam, along with the South Orange Village Board of Trustees. The proposed dam is not the only construction project slated for South Mountain Reservation. Essex County recently announced a $30 Million project to improve both the South Orange Avenue 's-curves', and landscaping at the Crest Drive entrance to the park. Two new bridges will also be built. A letter carrier for the United States Postal Service was the victim of an armed robbery in the eastern part of Maplewood on Tuesday afternoon. According to a statement from Capt. Marucci of the Maplewood Police Department, the robbery occurred in the 200th block of Laurel Avenue, which is near the Irvington Township border. The incident took place at approximately 4:41pm. According to Capt. Marucci, the "mail carrier was delivering mail...when he was approached by two black males one armed with a handgun. The suspects demanded the mail carriers phone and money then fled the scene on foot eastbound on Laurel Ave". The suspects are believed to be around 20 years old and six feet tall. The robbery is under investigation by both the Maplewood Police Department Detective Bureau and the United States Postal Inspectors Office. Anyone with information about the robbery is asked to call the Maplewood Police Detective Bureau at 973-761-7926. 'Save Our Reservation' Group: Mayors' Council Takes "Dam Option off the Table"
The 'Save Our Reservation' group posted the following message on their Facebook page today. "NEWS FLASH! The Mayors' Council of Union and Essex County voted unanimously yesterday to take the dam option off the table! This is the group that the Army Corps and the DEP has been looking to for years for public input, and which the Corps directed to narrow down the alternatives for further study. The Council voted to ask the Corps to pursue options 4 and 7 (See Army Study on our website at www.sornj.org). More details later. But for now, congratulate yourselves if you signed our petition, with now well over 5,000 signatures!" The development is expected to be completed in late 2015. The construction work which recently began on the "S-Curves" of South Orange Avenue (Route 510) in South Mountain Reservation is part of a $30 Million project to modernize the roadway, according to Essex County Public Relations Officer Anthony Puglisi. The project was announced in 2009. The construction will take place from the intersection of South Orange Avenue and Brookside Drive/Cherry Lane in Millburn to Harding Drive in South Orange. In an email to Essex County Place, Puglisi said that the "federally-funded project to modernize South Orange Avenue is expected to last about two years". However, according to Puglisi, "traffic lanes in both directions will remain open during construction (and) there will be no closures". Several trees have already been removed along South Orange Avenue in South Mountain Reservation. According to information given by the county when the project was first announced, the roadway will be widened so that there is additional shoulder space in the eastbound lanes. In addition, the sharpness of curves will be reduced. Also, a new drainage system will be created. Two new bridges over South Orange Avenue will be built. One will be for replacing the existing Lenape Trail bridge, and the other will be located near the Girl Scouts camping area. United States Senators Cory Booker (D) and Robert Menendez (D) have announced that the South Orange Fire Department will receive $339,600 under the FEMA Staffing for Adequate Fire and Emergency Response (SAFER) program. The Fire Department will use the grant to hire two additional firefighters. 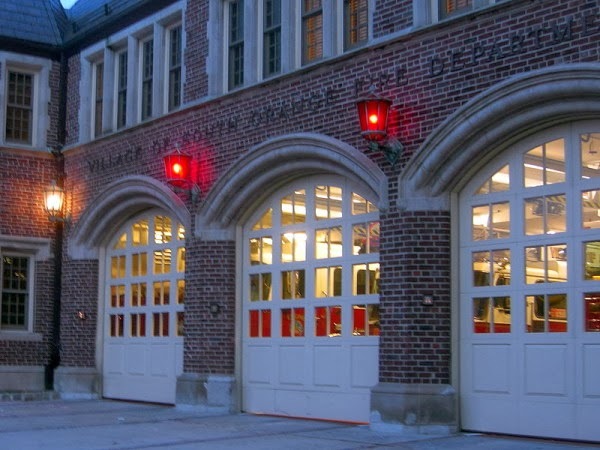 According to a press release from the office of Senator Menendez, "The highly competitive SAFER grant program provides funding directly to fire departments and volunteer firefighter organizations in order to help them increase the number of trained “front line” firefighters in their communities." The SOFD and a fire company in Pemberton, Burlington County both received grants under the program. Senator Booker said that "the funding...will help keep people in South Orange and Pemberton, New Jersey safe, putting new firefighters on the ground and helping to recruit the staff necessary to protect our communities...I am grateful for FEMA’s continued support." Senator Menendez said "this federal funding will put the necessary firefighters on the job to ensure effective responses to local emergencies in these communities". Senator Menendez, along with Congressman Donald Payne and South Orange Village President Alex Torpey, visited the South Orange Fire Department on Wednesday to announce the grant. On Friday March 21th, South Orange Village officials, staff, members of the Redevelopment Team, representatives from the Jonathan Rose Companies, and other community members will break ground on the Third and Valley development. The groundbreaking will occur at 153 Valley Street in South Orange near the corner of Third and Valley Streets at 10:00am. Following the groundbreaking ceremony, refreshments will be served at the Loft at the South Orange Performing Arts Center at 1 SOPAC Way. According to an event listing from South Orange Village, "Third & Valley is a 215-unit LEED Silver rental apartment community...consisting of 193 market-rate units and 22 units reserved for moderate income households...(and)...includes a 513 space structured parking deck for public and private use, 3,000 square feet of retail space, and thoughtfully landscaped public areas". Elizabeth Aaron, a current assistant principal at Columbia High School in Maplewood, has been unanimously selected to become the principal of the school by the South Orange Maplewood Board of Education. According to the SOMSD, Aaron will start her new role on July 1st. Kirk E. Smith, who is currently the interim principal at the school, will retire from the SOMSD on June 30th. Smith had been named interim principal after the retirement of Dr. Lovie Lilly. Aaron was not immediately available for comment. The Jersey Animal Coalition shelter at 298 Walton Avenue in South Orange has been shut down by the South Orange Department of Health, and a sign on the front door read that the "facility (was) under quarantine". No animals are being permitted to enter or leave the shelter, and another sign at the front door read that no volunteers were permitted inside the shelter. The was shelter was closed in part because three cats at the JAC shelter have been infected with ringworm. A ribbon-cutting ceremony was held at both the Main and Hilton Branches of the Maplewood Memorial Library today in honor of the library becoming the 75th member of the BCCLS (Bergen County Cooperative Library System) Library Consortium. This allows Maplewood Library cardholders access to books from libraries across Northern and Central New Jersey, Maplewood Mayor Vic DeLuca, Assemblywoman Mila Jasey, and representatives from the library and BCCLS spoke at the event at the Main Library. The ceremony was attended by dozens of community members, library employees, members of the Friends of the Maplewood Library, and by students at Morrow Memorial Church Preschool. Photos of the ribbon-cutting ceremony there are below.